Eternal Orthodox Church calendar for the 07.07 year 2017. 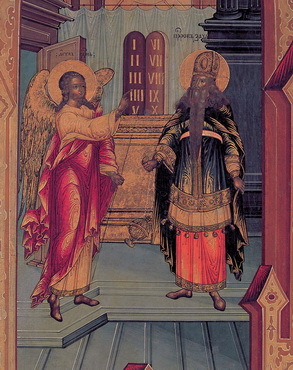 Six months before his appearing to the most holy Virgin Mary in Nazareth, the great Gabriel, archangel of the Lord, appeared to Zacharias the High Priest in the Temple in Jerusalem. Before he revealed the miraculous conception by a virgin who had not known a man, the archangel revealed the wondrous conceiving by an old and barren woman. Zacharias was unable at once to believe the words of God"s herald, and for this his tongue was bound in dumbness and remained thus until the eighth day after John"s birth. The kinsfolk of Zacharias and Elisabeth gathered together on that day for the infant"s circumcision and naming. When they enquired of the father how lie wished the child to be called, he, being still dumb, wrote on a slate: "John". At that moment his tongue was loosed and he began to speak. Zacharias"s house was on the heights between Bethlehem and Hebron. The news of the angel"s appearing to Zacharias, of his dumbness and of the loosening of his tongue at the exact moment that he wrote "John", was carried throughout all Israel, coming to Herod"s ears. So. 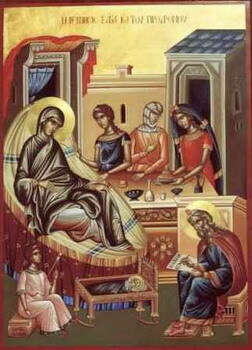 when he sent men to kill all the infants around Bethlehem, he sent men off to Zacharias"s family house in the hills. to slay John also. But Elisabeth hid " the child in good time. The king was enraged at this, and sent an executioner to the Temple to kill Zacharias (for it was then his turn to serve in the Temple again). Zacharias was killed between the court and the Temple, and his blood clotted and solidified on the paving slabs, and remained as an enduring witness against Herod. Elisabeth hid herself and the child in a cave, where she soon died. The young John remained in the wilderness alone. in the care of God and His angels. A friend and contemporary of St Paulinus of Nola (see January 23rd), he was probably a Slav* and he preached the Gospel among the Slavs in the region around Nis and Pirot. The great impression that Nikita made on the Slavs is best shown by the hymn that St Paulinus composed in his honour: 'Oh, what a happy change! The hilly, impassable haunts of bloodthirsty robbers now shelter peace-loving dwellers, bandits-turned-monk. Where once the rule of the wild beast held sway, the choir of angels is now to be heard. The righteous now dwell in the caves where before were infamous men.' 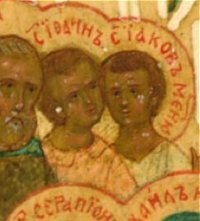 St Nikita's capital was the city of Remesiana, which some people reckon to be Pirot. He wrote several books, six of them on the Faith and one on a fallen woman who awoke many to repentance. 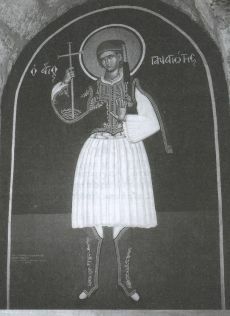 St Nikita entered into rest in the Lord in about 414. *Author's Note: Philaret says in his book: 'The Saints of the Southern Slavs', that Nikita was a Slav and lived in Pirot. They were all brothers, Roman soldiers during the reign of the Emperor Maximian. When the Romans were waging war against the Scythians beyond the Danube, St Orentius fought a duel with Marathom, the Goliath of the Scythians, and killed him. In thanksgiving, the Roman army offered sacrifice to idols, but Orentius and his brothers declared themselves to be Christians and therefore unable to offer sacrifice to deaf and dumb idols. With no consideration for their military valour, they were tried and sentenced to exile in the Caspian region, but all of them died on the way, one after the other, from hunger and torture, and they went to their rest in the Kingdom of Christ.